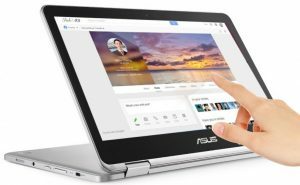 I’ve been a big fan of the Flip line of Chromebooks from Asus. It started with the absolutely fun 10.1″, which was a goddess-send on cramped flights (hello, Spirit?). I moved on to the C301, a plasticky thing that was all standard Chromebook and not as much fun. But once I saw the almost identically named C302. an all-aluminum unibody beauty, I knew I needed one. On the other Flips, I installed Crouton. That’s software that allows you to run Linux on top of ChromeOS. That’s very useful: ChromeOS is great for media consumption and online work, but it lacks in everything else I want from a laptop. You can’t program, you can’t use software that isn’t available online, etc. Crouton allows you to do all that and then some and I loved it. Still, I run Linux natively on all my computers and it was a pain to deal with the limitations of an add-on. Cron jobs wouldn’t work, init scripts weren’t run, and whenever something didn’t work as expected, the first task was always to figure out if it was a problem with the environment or with my code. I wanted real Linux, not just an emulation. But I wanted to be able to continue using ChromeOS because Google is powerful enough to force media companies to run their stuff on its platform. Dual-boot it had to be. Fortunately, since installing on the C301, the options for Linux installation have vastly improved and gotten more stable, easy-to-use, and reliable. Also, the first Linux distributions specifically meant for Chromebooks have appeared and sounded quite awesome. For the rest of the world, it all started in the Fall of 2008. There was a mailing list that only the most geeky geeks listened to, and one dude nobody had ever heard of before posted a whitepaper. People started working with him because he seemed to have a great idea. Then things took off. Then they really took off. Then, one day, the man didn’t say good-bye, but handed over the keys to the idea to a bunch of friends. And disappeared. And then, a little over three years later, he sends a message from the cyber-grave. Only to tell us he’s not someone. When Bitcoin was young, there were services that gave Bitcoins away so people could play with them. You logged onto one of the sites and got 5 Bitcoin (or BTC for short) for free, just like that. You could go back as many times as you wanted. Today, those 5 BTC are enough to buy you a car. Depending on the day it’s a beater or a beemer. The man that published the whitepaper and then disappeared has a name, Satoshi Nakamoto. Nobody knows if that’s the man’s real name. Nobody, in fact, knows if Satoshi Nakamoto is a single person, or a woman. He claims to be Japanese, claims to have been born and to live in Japan, but we have good reasons to believe neither is the case. He says he was born on April 5th, 1975, but nobody can verify that. And yet, Satoshi Nakamoto has given us a technology that has the potential of changing the world. He’s like a faceless prophet that leads his people to a better land and vanishes in self-exile once we get there, following the commandments of a God we do not understand. And because he vanished without a trace, because he didn’t leave a whole lot of traces to begin with, and because Bitcoin has become so huge, everyone is asking the same question: Who is Satoshi Nakamoto? Rocky Mountain National Park / First Open Week! Colorado is justly famous for its mountains. The Rockies rise up in the middle of the continent like a wall meant to stop colonization and make the place rugged, remote, and scenic. Alas, humanity is really good at beating down nature, and the Rockies were no match for our relentless pursuit of wealth and suburbs. By now, there are homes everywhere in the state, except where Federal land ownership prevents construction. But the mountains are still there, marvelous in their beauty and isolation. Colorado is also famous for a few other things. People think it cold (which it really isn’t, thanks to abundant sunshine and thin air) and they are reminded by the name of the state of the river, the mighty Colorado that scoured the Grand Canyon in the almost infinitely long time it has been flowing. Take these three things: the mountains, the snow, and the Colorado River, and put them all in one place. That’s bound to be the most Coloradan place in the state, right? And that’s what is Rocky Mountains National Park. Home to both the headwaters of the Colorado river and Longs Peak, one of the most prominent Fourteeners in the United States. Land of hikers and backpackers and hordes of tourists. There is only one road that cuts through the park, the aptly named Trail Ridge Road. Most people drive it East to West, starting in the very picturesque town of Estes Park, climbing up to the Alpine zone, and then descending into the Colorado River Valley. Every year, the road is closed when the snow storms make passage impossible. Every year, Coloradans wait for the weekend when the snow is cleared and we can all drive to the most beautiful landscape to stand in an endless line of cars. Getting into Estes Park is easy. You follow one of the three highways, US 36, US 34, or CO 96, that converge onto the town. You also can’t miss Estes Park: once you enter the valley, you’ll see a beautiful town surrounded by high mountains in a green valley, just behind a reservoir. It’s a spectacular setting, as evidenced by the number of real estate companies that set up shop in town. Are you an extrovert or an introvert? If you’ve ever done a Myers-Briggs test, you are familiar with the questions: Do you prefer being in a crowd when you are stressed, or would you rather retreat? Do you have lots of friends, or just a few, very deep ones? Do you prefer a loud party of 100 or an intimate gathering of 4? While in parts of the business world the Myers-Briggs Type Indicator is almost a religion, it was originally meant as a tool to explain that different people think differently, and that these differences of manner shouldn’t be read as differences of attitude. It’s not that a Perceiver is indecisive – it’s that a P needs data to form an opinion. It’s not that a J is impatient, it’s that until the thing is finished, it may well not exist to her. The I vs. E dimension, introversion vs. extroversion, is something many people easily identify with, much more so than the other three. In fact, while all other ones require explanation just for anyone to understand what they mean, with this dimension it’s the other way around: people identify first, and then they usually need to be explained what the dimensions mean. The problem with this dimension is that many people that aren’t on the ends of the spectrum don’t quite know what to make of the classification. They feel neither introverted nor extroverted, but they don’t particularly identify with other “zeros”. What’s going on? Primary human emotions are few and powerful. Research tells us there are six of them: happiness, sadness, fear, anger, surprise and disgust. They are very distinct and come from different places in our brain, having evolved out of reactions to external influencers. Fear, for instance, is an emotion meant to deal with threats. Disgust is supposed to prevent us from doing things (usually: eating them) that could be dangerous for us. Surprise is the way we deal with the unexpected and opens us up for new information. I bought my house in Lakewood in great location. To my West, the mountains in a series of ascending peaks, including the giant tower of Creation Rock in Red Rocks Park. To my South, the beautiful Bear Creek Lake Park (also: a handful to say) with the public beach and water skis on Soda Lake. To my North, of course, the big hulking mesa known as Green Mountain. It’s been a while I’ve lived here, but I never hiked up Green Mountain. Much of it was simply because it was too cold or snowy, but finally it’s warmed up and it was time to try hit the summit. I packed a protein bar and carried a giant jug of water (you’ll need both) and set out to conquer my first Colorado mountain (that didn’t have a ski lift). The first pleasant surprise is the trail system. Trails cross the mountain everywhere, they are superbly maintained, and the place is teeming with hikers, bikers, and occasionally horse riders. Google Maps, which I used for orienting, only has a small subset of the trails available, so make sure you get a better map from the City of Lakewood site or at the parking lot. I am lucky and don’t have to drive at all. I just walk from my front door and I am on the trails nine minutes later. If you have to park, though, there are several pretty spacious lots, that though fill up relatively quickly on a warm weekend. The main entrance is on W Alameda Parkway on the East side, while the quickest way to the top is on the West side, across the mountain from CO 470 (Rooney Road Trailhead). Jen ofta problemo: vi volas skribi ion en Esperanto komputile, sed vi ne havas Esperantan klavaron. Vi nur havas vian nacian klavaron, oer kiu vi scipovas tajpi viajn naciajn literojn kaj la aldonajn anglajn. Kion fari? Ĉar mi ja estas komputilisto, mi emis konsideri la teorian aspekton de ĉi tiu demando. Unue, konsideru ke ĉiuj modernaj komputiloj minimume komprenas la Unikodan literaron. Ĉar tiu inkluzivas la Esperantajn (ĉapelitajn) literojn, se vi scipovas kiel enmeti ilin, la komputilo aŭ retejo probable konservos ilin. La problemo plej ofte estas via klavaro, kiu ne enhavas capelitajn literojn aŭ manieron aldoni ilin (aŭ ian ajn Unikodaĵon). Kion fari? La unuaj 127 koderoj de Unikodo estas specialaj. Ili estas nomataj Askiaj literoj, devene de Usona mallongigo ASCII (American Standard Code for Information Interchange – Usona Norma Kodo por Informada Interŝanĝo). Krom kelkaj apartaj simboloj kiel la punkto, komo, ‘@’ kotopo. tiu kodo enhavas la anglan Latinan alfabeton majuskle kaj minuskle. Tio estas dufoje 27 literojn. El 27 literojn, Esperanto uzas 23 – ni ne uzas Q, W, X, Y. Aldone, Esperanto havas ses ĉapelitajn literojn, Ĉ, Ĝ, Ĥ, Ĵ, Ŝ, Ŭ. Do. Esperanto bezonas 29 literojn sume, tio estas du pli ol la angla Latina alfabeto provizoras. Kiam modemulo volas enŝovi pli grandan piedon en malpli grandan ŝuon, li aŭ ŝi scias, ke kaj la ŝuo disfalos frue kaj la piedo doloros ege. Kiam komputilisto volas enŝovi pli grandan literprovizon en malpli grandan kodon, oni devas elpensi manieron kiu malpleje dolorigas kaj pleje facilas. Estas kelkaj facilaj elektoj. Ekzemple, utilas ke la kvin vokaloj restu senŝanĝaj. Kiel eble plej multaj konsonantoj ne ŝanĝu – sed io ajn ja devas ŝanĝi. Jen la strategioj, kiujn ni povas uzi kaj la resultaj kodigoj. Multaj homoj ne ŝatas uzi la literon Ĥo, kiu estas la plej malofte uzata en la Esperanta alfabeto. Fakte, en plimulto da okazoj, oni havas apartan version de vorto, kiu ne enhavas tiun literon. Ekz. konsideru ĥoro, ankaŭ skribite koruso. Oni diras ke “multaj” ne scipovas prononci la literon, do ĝi malestigu. Ĉu tio veras aŭ ne ne gravas, ĉar ni simple volas malestigi kiom eble plej multaj literoj por faciligi rekodigon. Alia litero kies utileco estas dubinda estas Ŭo. Ĝi estas duonvokalo kaj ege pli ofteca en la Esperanta ol Ĥo. Tamen, ĝin oni prononcas kiel Uo, kaj la nura diferenco inter vorto kun Uo kaj Ŭo estas, kiam tiuj literoj estas en la antaŭlasta silabo, kie la akcento ŝanĝiĝas. Laŭro ne prononciĝas same ol lauro. Se vi volas esti komprenata, endas ke vi ne ŝanĝu la alfabeton multe. Kie vi devas ŝanĝi ĝin, uzu facile memoreblan anstataŭigon. Ekzemple, se vi volus anstataŭigi la literon Lo, vi povus uzi la ciferon 1. Eĉ ekzistas alfabeta anstataŭigo. kiu uzas renversitajn ciferojn por kelkaj literoj – 7 estas Lo, 4 estas A, 3 estas E, kotopo. Kaze de la ĉapelitaj literoj, oni konsideru la aliajn latinigojn de lingvoj. La ĉina, ekzemple, uzas la literon Qo por la sono de la Esperanta Ĉo. kaj la Xo por la Esperanta Ĵo. Ĉar ni havas 26 literojn sed bezonas 28, se ni forigas Ĥon, ni nur bezonas unu aldonan literon. Ni povas selekti du simbolojn (majuskla kaj minuskla) por la lasta litero. Logike, oni uzus la latinan Wo por Esperanta Ŭo, kaj latinan Yo por Esperanta Jo. Tiel, ni povas uzi Jo por alia litero, ekzemple Ĝo (kies prononco oni skribas Jo en kelkaj lingvoj, kiel la angla kaj la ĉina rekodigo.). Fakte, se ni aldonas la rekodigojn el numero 2, ni havas ĉiujn literojn krom Ŝo. Ŝon oni skribas “sh” en la angla kaj ĉina rekodigo, do oni ne trovas unuliteran rekodigon. La avantaĝo de ĉi tiu rekodigo estas ke, krom por Ĥo, oni facile povas aŭtomate re-rekodigi ĝin al Esperanto. La malavantaĝo estas, ke estas iom malfacile legi vorton, kiu entenas simbolojn. La avantaĝo de ĉi tiu rekodigo estas, ke vortoj ĉiam aspektas kiel vortoj. La malavantaĝo, ke estas iom ĝene legi Won kiel Ŝon. Tamen, ĉar Wo ne estas litero en la Esperanta alfabeto, oni alkutimiĝas pli rapide ol penseble. Aldona samtipa rekodigo okazas, kiam oni uzas la sonojn de la Germana alfabeto. En la Germana, la litero Wo prononciĝas Vo, kaj Vo ofte prononciĝas Fo. So oni uzas tiujn valorojn kaj aldone rekodigas Ŝon al Fo (ĉar en la malnovgermana alfabeto, So skribiĝis simile al minuskla Fo), oni havas novan rekodigon. La avantaĝo estas por Germanoj, kiuj facile legas tiun rekodigon. Se vi konsideras la antaŭon, ni vere nur bezonas aldonan simbolon por Ŝo. Oni povus simple decidi, ke oni uzu diliteran simbolon por tiu escepto. La nura problemo estas, ke ne ĉiam eblas scii, ĉu la literoj So kaj Ho unu apud la alia estas la litero Ŝo en la rekodigo, aŭ simple kunmetaĵo. Ĉu “pasharo” estas haro kiu pasas, aŭ aro da paŝoj? Oni povas uzi malpli oftan duliterumadon, kiel ekzemple la poleca “sz”. Ĉar estas ege malmultaj radikoj, kiuj komenciĝas je Zo, la literparo sz estus tre malofte aparta kaj plej ofte rekodigo de Ŝo. Amiko demandis, kial ajn la esperanta havas literon Ĉo, kiam ĝia sono simple estas To kaj Ŝo. Nu, mi diris, en la Esperanta ekzistas garantio ke ĉiu skribaĵo havas nur unu prononcaĵon, sed ne male. Tamen, kiam oni devas ŝpari, oni povus malestigi tiujn literojn, kiuj povas skribiĝi per aliaj. Estas tri el ili (aldone Ŭo): Co, kiu estas To + So, Ĉo, kiu estas To + Ŝo, kaj fine Ĝo, kiu estas Do + Ĵo. Ĉar ni ne plu bezonas Ĝon, ni povas uzi Jon por Ĵo. La litero Ĝo, do, skribiĝas nove “DJ”. Rimarku, ke ĉi-kaze mi uzis Xon por Ŝo kaj decidis tute ne uzi Qon. Evidente, ekde kiam Esperanto unue estiĝis, oni devis konsideri la maleblecon uzi ĉapelitajn literojn. Zamenhof sugestis la Ho-sistemon, kie oni uzas la literon Ho post ĉiu senĉapela litero por indiki ĉapelitan. Ĉar tio kreas multajn konfliktojn (konsideru la kazon de pasharo supre), oni sugesti uzi Xon aŭ apostrofon anstataŭe. Multaj laŭregulemaj Esperantistoj insistas, ke nur la Ho sistemo estas Fundamenta kaj do ĝi estas la sola, kiu uzeblas. Malfeliĉe, la Ho, Xo, kaj Apostrof-sistemoj ne facile legeblas, ĉar en ili la longeco de vortoj tute ŝanĝíĝas. Konsideru ĉi tiun lastan vorton, “ŝanĝiĝas.” En la Ho sistemo, ĝi estas “shanghighas.” Mi konsideras tion malfacile legeblan. Originale: Laŭ Ludoviko Zamenhof bongustas freŝa ĉeĥa manĝaĵo kun spicoj. Xo-sistemo: Laux Ludoviko Zamenhof bongustas fresxa cxehxa mangxajxo kun spicoj. Ho-sistemo: Lauh Ludoviko Zamenhof bongustas fresha chehha manghajho kun spicoj. Apo-sistemo: Lau’ Ludoviko Zamenhof bongustas fres’a c’eh’a mang’aj’o kun spicoj. Simbola Rekodigo: Law Ludoviko Zamenhof bongustas fre/a qeha manjaxo kun spicoy. Woŝa Rekodigo: Lau Ludoviko Zamenhof bongustas frewa qeha manjaxo kun spicoy. Germanema Rekodigo: Lau Ludowiko Zamenhov bongustas vrefa qeha manjaxo kun spicoy. Duliterema Rekodigo (sh): Lau Ludoviko Zamenhof bongustas fresha qeha manjaxo kun spicoy. Duliterema Rekodigo (sz): Lau Ludoviko Zamenhof bongustas fresza qeha manjaxo kun spicoy. Unusona Rekodigo: Lau Ludoviko Zamenhof bongustas frexa txeha mandjajo kun spitsoy. Kiun vi preferas? Mi konfesas, ke el tiuj, la Sz rekodigo ŝajnas plej legebla al mi. Sed mi volus scii, kion vi opinias! Clara is back to life! After standing in the back of the garage in San Diego for years, blocked by flooring, and then in a storage unit in Denver for months, she finally is legit in Colorado and the weather is cooperating. All hail the Girl! One of the first things I did was familiarize myself with motorcycle riding rules in the state. I knew that California is fond of bikes and the lobby there (formerly: here) has worked hard on making motorcycle riding safer and more expedient, resulting in changes to the rules of the road. Motorcycle riders can ride on any HOV lane (unless expressly forbidden), can ride in staggered formation (one rider to the right, one rider to the left on a single lane), and most importantly, can share lanes with other vehicles. Lane splitting is one of those things that people have strong feelings about. Car drivers generally hate the motorcycles that come out of nowhere to their left and right, while motorcycle riders know the most dangerous thing to them (us) is drivers not noticing us (well, short of alcohol, a no-no if there ever has been one on a bike). Driving between cars, I can say from experience, is much safer than driving next to a car, because the latter case opens up the possibility of the car changing lanes into you. Also much safer: when you move between standing cars at a traffic light. You are safe between cars, but being the last vehicle in line is hugely unsafe, because drivers notice the car ahead of you before they notice you. In any case, I went to the web site and found there are only three sections, each with minimal information. Helmets are not mandatory for anyone over 18, but eye protection is required. (Frankly, anyone who rides a motorcycle without glasses, goggles, or a visor should be sent for urgent mental health checks.) Lane sharing is illegal, full stop (grumble). Bike passengers have to have foot rests available and have to use them (something tells me someone’s feet got caught in a wheel at 80 mph…). And finally, no towing of bikes while riding, in a vicious attempt to single-handedly destroy the Funny or Die Darwin Awards Category. The snow falling in the mountains is now measured in feet, not inches and the temperatures are so low (-10F) that I had to move my remaining boards into the utility closet, where the furnace will keep them warm. For now, it appears, I have to cut back on my surfing sessions while still not being able to drive up the mountains to snowboard (because of the feet of snow that block the freeway). A good time to reminisce! I took up surfing late. I mean, I didn’t live in SoCal until 2009, but even then I waited years before I tried it out. Surfing, from the outside, looks boring: most of the time, surfers are just sitting in the water waiting for waves. Not exactly the most appealing thing for a hyper person like me. One day I realized UCSD had cheap surf lessons and I decided to give it a try. Even if I didn’t like it, I’d still meet new people that were trying to have fun, how bad could it be? Turns out the lessons were not so hot. Or they were too hot: in my ignorance, I had bought a 7mm wetsuit on sale and showed up on the rare fogless day at La Jolla Shores. To make things worse, Day One was on land. I think I may have overheated several times and had to jump in the water (much to everyone’s amusement) to just cool off. I had just finished the beginners’ class and was a total noob. Not a kook, because the class had taught me proper etiquette and rules of engagement – which meant that I barely got a wave an hour to even try. To make up for the boredom, I had put an MP3 player in a plastic bag and listened to music through underwater headphones. I was just sitting there, bopping up and down at Scripp’s, praying nobody would take the next wave. I hadn’t paddled in maybe 15 minutes and was bored. Once in a while, I would turn around to see how far it was to shore and how embarrassing it would be to paddle back. Pebble Is Dead – What Now? The last we all heard of Pebble, they had funded a successful KickStarter campaign to get the new version of their smartwatches out. They had the Pebble 2, Pebble Time 2, Pebble Round 2 in the pipeline. I was waiting for my Pebble Time 2 to arrive any second – the Pebble 2 had already been shipped. Yesterday, I received not one but three updates. As Pebble put it, “due to various factors […] Pebble is no longer able to operate as an independent entity.” So they shut down operations. While Pebble gear is still available on Amazon and other sites, Pebble itself is not selling any more inventory, nor updating their products. Software is not going to be updated, either, and after a while the Pebble app is going to die, when the first OS incompatibility hits, best guess about a year from now. What happened? Fitbit apparently agreed to buy out the developers, and not much else. Refunds are being processed: they were supposed to be done by March of 2017, but now they are saying December 16. That probably means a cash infusion from Fitbit before the deal can get fully consummated. There may have been some personal event going on, like a dissatisfied CEO or the like. L’America: How Could Trump Be Elected? There is a technical reason: despite getting more than two million votes more than Donald Trump, Hillary Clinton didn’t have her votes distributed in a geographically diverse enough way. America is a federation, and as such the constituent states have a say in government. In theory, the winner of the presidential election would need a majority of both states and people, but that could easily lead to a situation where (like in this year’s case) the majority of the states doesn’t want the same as the majority of the people. To make elections easier and faster, the Constitution settled on a numerical formula that is a brilliant compromise: each state gets as many votes in the election of the president as it has Senators and Members of the House. The Senate is composed of two Senators per state (so that part translates to one vote per state), while each state has a number of Members of the House proportional to its population (so theoretically, that should translate to a majority of the people). The Constitution settled on another odd compromise: each state would send voters (called electors) to Washington, and these electors decide who’s going to be president and who vice-president. Over time, the electors were specifically selected for allegiance to one particular candidate, and some states even punish those electors that don’t vote for the presidential candidate for whom they were sent. So, it could happen that a narrow win in three states sent Donald Trump into the White House, while he didn’t have a majority of the vote. The formula chosen favors Republicans in general, because central states were drawn to be of manageable size, and so a lot of the rural states in the middle of the country have small to tiny populations. Wyoming, for instance (a gorgeous place!) has only 1.5% of the population of the most populous state, California. In fact, the USA has 31 cities that have more inhabitants than all of Wyoming, but have none of the electors (3) that Wyoming has. After this civics lesson, the political angle. Hillary Clinton was reviled. Part of it was that the media wanted to make the contest more interesting by tearing down the front runner. Part of it was blatant misogyny. Part of it seems to have been manipulation by foreign powers, especially Russia, which seems to have fed information to WikiLeaks. it didn’t help that the founder of WikiLeaks had an ax to grind with Ms Clinton – maybe a remnant of the days he had to hide in the Ecuadorian embassy in London.